The English Course is an integrated lower intermediate English language course for students from false beginner to lower intermediate levels. 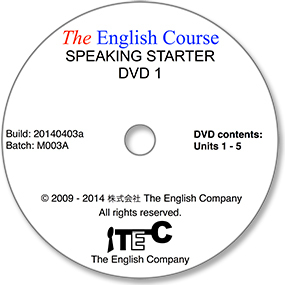 Speaking Starter is an integrated English language course for false beginners. 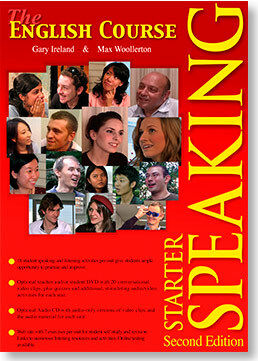 Speaking Starter is principally intended for young adult learners at college or university level. The aim of the course is to balance the communicative-based approach to language learning with cutting-edge technology, for both classroom use and student self-access study. The units in the textbook are designed to cover appropriate and necessary vocabulary and structures for this level. Each unit in the course includes the following: 2 video clips for listening comprehension, the demonstration of appropriate conversational settings and language use; numerous student speaking and listening opportunities; and 7 online revision/practice exercises on the student self-access web site, plus additional audio material for students to use. Line-by-line clips from the video to practise pronunciation (on DVD only). Speaking practise with the target language from the video using the video script. Controlled speaking practise using a substitution drill with the script of the video clip. Presentation and practise of key vocabulary items or language structures related to the topic of the unit. A listening activity to complete missing information, using one or more short audio clips. An Q&A information exchange activity, using target language from the preceding activities. Usually a vocabulary or grammar quiz presented in an enjoyable format (on DVD only). A listening activity to complete missing information, using one or more short audio clips when heard for the first time. A listening activity to complete further missing information, using one or more short audio clips when heard for a second time. A listening activity to complete final missing information, using one or more short audio clips when heard for a third time. A two-part listening activity to complete or choose questions in an interview and to select answer options. An peer-to-peer interview task, using questions from The interview activity. A light-hearted end-of-unit task usually using a quiz-based format on the DVD. Click the picture of the book on the left to open and/or download a PDF file of Unit 5 from the textbook.